Just popping in with a preview of the next pattern to be released. It's been a long, long time, I know. I'm so excited for this one, he makes my heart skip a beat! I'm currently editing and testing the pattern so it will be a few days or longer before the pattern is ready. Yes, it will be free. I had lost my inspiration to design quite a long time ago. I was wrapped up with other projects and even though I love to crochet I didn't feel that tug in my heart for anything in particular. I kept waiting for it to return. The other night I decided that's it, I have to do something so I started with an idea and a couple of pictures for inspiration and this dragon was born. I was so happy I could have cried! He's staring down at a 12 inch ruler, he's about 16 inches tall. Thanks for stopping by, happy crocheting! 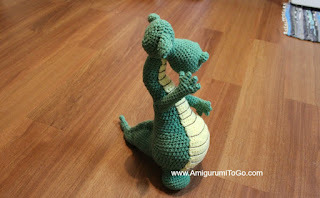 Love your dragon! He's adorable. Can't wait to make these for my 3 boys! I love your work. oh he is magnificant - I know what I'll be doing later this summer and if my nephews get to see my one I'll be doing it several times! Absolutely enchanting. Can't wait to get started on one for myself. Thank you for your generosity. I am so excited that you designed a dragon!!! I cannot wait for you to post it! I also have not felt inspired to design, crochet, sew, etc. lately but this dragon may give me a kick start! Have considered things like fairies, gnomes, etc.? Oh yay? I'm so excited. I just finished 2 Dress me Bunnies ( and of course the clothes! ), Koala, Little Bigfoot Elephant, The big Pig ( vest and dress)and just put my hook down from the Valentine Bear. I came to see what was next and to my surprise I see the dragon. My heart just started thumping, then the smile came! I'm going to see if I can get in the Little Red Riding Mouse before you post anything. I never thought I could do amigurumi until I found you! You are the best teacher! You just explain so well and I love your voice. So creative and talented. Thank you for sharing with us all. Can't wait for the pattern. He is so adorable! That's okay to step away from designer for a bit. I am amazed at how many things you have created and shared. Thank you so much for your generosity! Oh my goodness!! My little sister (in her 30's) LOVES dragons. She was jealous of the Easter "devil" I made my neice. She asked me if I could make a dragon. I found a pattern and was able to send it to her for Mother's Day. It was a nice pattern but nothing like yours. I am going to have to make this for her for her birthday/Christmas presant. It has to be the best design I have seen. You are truly talented. I CAN'T WAIT FOR THIS!!!! Wow, this is a great design. He is adorable and the kids will love him. Wonderful. I Love it. I can't wait for the pattern too! I have been looking for a GOOD dragon pattern but none of them seemed to be what I wanted (although cute)I checked up on your page while trying to decide on what kind of frog pattern to use, as I like your little Wee Bits critters, and saw this! YAY! Thank you for all your patterns and tutorials. This is so perfect! 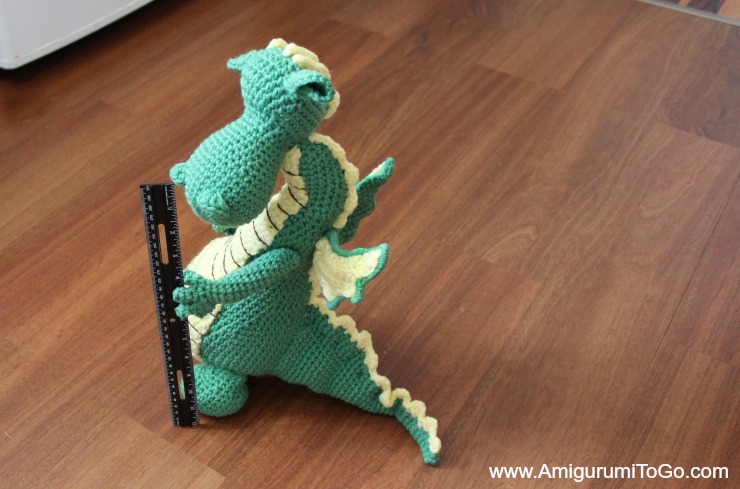 I have been looking for a 'good' dragon pattern for a while now, others have been close or just cute but this is exactly what I wanted! YAY! Thank you so much for all your patterns and tutorials, you explain so well an make learning new things enjoyable. omgg sooo freakin stinkin cute, look how hes holdin his belly LMAO i love this and can not wait til hes ready!! This is so darn cute. My grandson will love this. I hope I can do it. 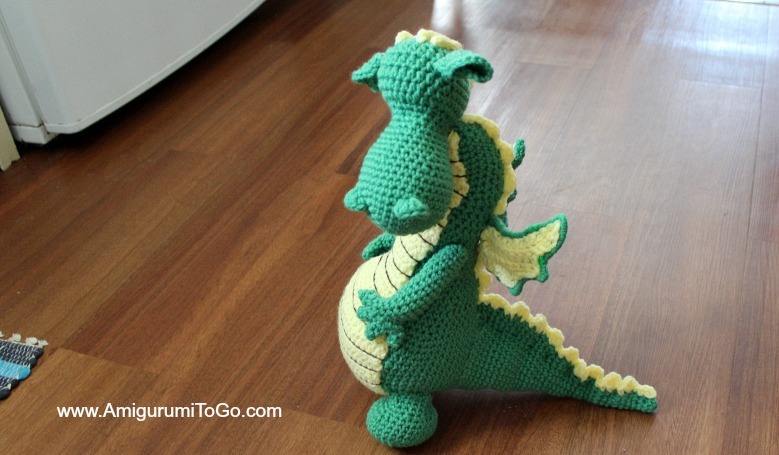 Hi - I just found your wonderful dragons... and have 3 grandsons that I would love to make one of each.. but I can't find the 3rd dragon pattern... have you published it yet? Thanks so much for these great patterns! 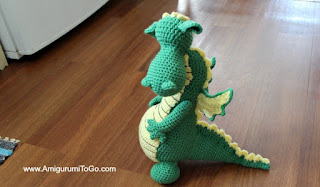 there's only one dragon pattern. I have the pattern in 3 separate posts. Part two, stuffing, shaping, how to make the ridges on tail and back. Plus there is a video series that goes through everything. click here you'll find all the links there.